FARM BILL UPDATE Last week the U.S. Senate passed its version of a new Farm Bill…. If you would like to request an interview or need more information, including ARA logos and photos, please email Kelly Marshall - [email protected] - or call her at 205-322-6395. Thank you for your interest in the Alabama Rivers Alliance. We are a nonprofit 501(c)3 organization. 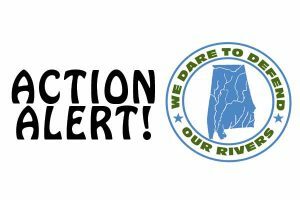 Alabama Rivers Alliance is a statewide network of groups working to protect and restore all of Alabama’s water resources through building partnerships, empowering citizens, and advocating for sound water policy and its enforcement. Alabama has more than 132,000 miles of streams and rivers with more types of plants and animals living in them than any other state in the nation. However, we also have one of the highest extinction rates in North America, many of which are species that live in our rivers. ARA is a proud member of Alabama Association of Nonprofits, Alabama ARISE, American Rivers, River Management Society & River Network.